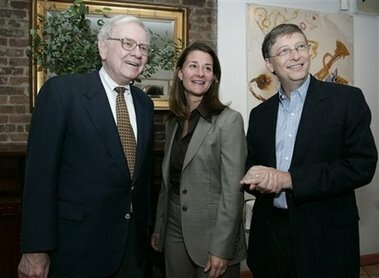 In a meeting of wealth that made most countries tremble in awe, Bill Gates, the world's richest man, and Warren Buffet, the world's second richest man (unrelated to Jimmy Buffet of Margaritaville fame), announced today a donation by Buffet that will essentially double the Bill & Melinda Gates Foundation's annual financial distribution. The Seattle-based foundation, which has assets of $29.1 billion, gave away $1.36 billion in 2005, and Buffet pledges approximately $1.5 billion annually. To put it bluntly, that's a shitload of money that will be spent on world health, poverty and access to technology in developing countries. In the United States, the foundation focuses on education and technology in public libraries and has been a savior for Seattle schools. Buffet's announcement comes just a week after Gates annouced he would be stepping down from his position at Microsoft to focus on the foundation. Call it a mid-life crisis for the 50-year-old Microsoft founder, or consider it a gift to humanity that one of the world's greatest minds is taking on the world's greatest problems. Now controlling the two deepest pockets in the world, Gates is up for the challenge, and his accomplishments could overshadow what he did with that little start-up called Microsoft.